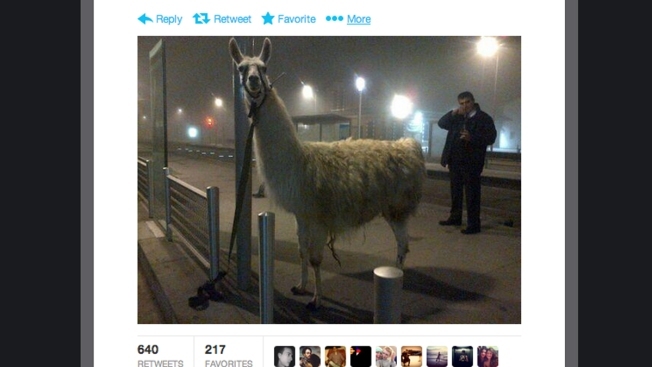 A screen shot of a tweet that shows Serge the llama tethered to a pole in the streets of Bordeaux. Five drunk guys swiped an unsuspecting llama from a circus in France last week and paraded him around the streets of Bordeaux, according to reports. Serge the llama joined the five party animals last Thursday for a night of debauchery that was captured in a series of photos that have gone viral on social media. There is even a photo of Serge taking the tram. The tram operator, who noticed the out-of-place creature, reported what he saw to the authorities. When officials showed up to the scene, the five men snuck away unnoticed and got on another train before they were arrested by the local law enforcement, according to Sud Ouest. The director of the traveling circus filed a complaint, which he later dropped and Serge the llama was returned unharmed.